Cloud Journey Part 3: Research and Scoping – The first real steps on the road to Cloud – Abstract, Pool and Automate IT! I’ve used a number of sources as I researched into Cloud computing which helped arm me with the knowledge I needed to sell the concept of Cloud computing successfully. This is where we started the Journey towards Cloud computing in earnest. When trying to sell the concept of cloud adoption or the move towards ITaaS, it is important to be able to talk with confidence and to be able to articulate the reasons why you are looking to do this, what business challenges you are addressing and what the impact of adoption might be. One of the first places I started in 2011 / 2012 was LinkedIn Groups. There were a series of groups that had closed memberships and were for peer level discussions. A lot of it had a technology focus but it was a useful place to start as there were also a lot of pointers to useful articles. Some of the groups I used were the ‘Cloud Computing’ group and the ‘Cloud computing, SaaS, and virtualisation’ group. Unfortunately over time these have been open to public membership and they get spammed with recruiters, sales people etc. The level of discussion has dropped off markedly. The NIST (National Institute of Standards and Technology) was also a key area of research. Their definition of cloud is widely accepted as the de facto standard. The model of four deployment types, three service models and five essential characteristics remains largely relevant five / six years after it was initially published. The organisation I work for also takes a Gartner subscription and this was really useful. Whether it was their discussion papers around trends they are seeing, the webinars with other organisations that have already been on a Cloud Journey to understand their pain points, or the discussion with some of their analysts such as Milind Govekar or Alessandro Perilli (now with Red Hat I believe). I think sometimes Gartner can be a bit more of a hindrance than a help, due to the generic-ness of a lot of their advice, however in this instance I found them to be mostly useful. As highlighted in previous blog entries my experience thus far was with Microsoft technologies and I was conscious that I didn’t want my thinking to ‘default’ to a particular product set. So in October 2012 I went to VM World in Barcelona to get a good view of the VMware view of the world. This was the year where they started to talk about the software defined data centre in earnest, in addition to talking about vCOPS and vCAC having completed the Dynamic Ops purchase that summer. I thought it was a great learning experience and my blinkered view of VMware as a hypervisor and management suite was duly blown away. Openstack was another area of investigation, however it soon became apparent at the time that no one was really using it and it had a definite focus to creating open source based solutions which is not what our internal solutions were based on. Not really a good fit technically and too much of a risk in terms being early adopters. We are an EMC customer and EMC have been on a ‘Cloud Journey’ since circa 2008. They have been very good at sharing the lessons they have learnt on their journey. The documents below are technology agnostic for the most part, but I found them interesting reading. I think a quick summary would be that the technology is the easiest bit; there is a whole raft of other things to consider that will make your initiative a success. We were actually in a procurement cycle for some storage around the time I was researching into this and the EMC account team managed to get myself and a colleague on a couple of their Cloud Architect courses. As with the documents above the course was technology agnostic … well petty much anyway; the marketing people got a page at the end of every section to say how XYZ product could meet the challenges in the previous chapter. In fairness they were reasonably even handed with it and I think Hyper-V and NetApp both got a mention as technology examples. 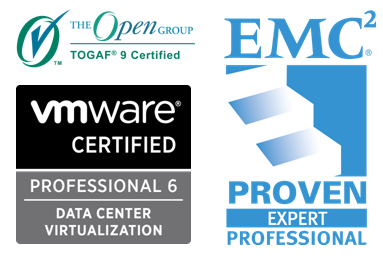 The EMC Cloud Architect certification track requires three courses to be completed and the corresponding exams passed. The courses were very worthwhile albeit the first two might be deemed a little basic for those with a good degree of data centre and virtualisation experience. The third course which covered IT as a Service was the one I derived most benefit from as it covered a lot of non technical areas such as designing appropriate organisational and governance structures, designing trust and security etc. It was after this last course that the scope or scale of the endeavour started to become more obvious. Looking at the above you might think my view of the world is a bit EMC tinted, but the truth is that I have bought and worked will all sorts of storage and its important to get the right product for the requirements. However that said they are seem like a great company culturally and what I have seen of their approach to cloud and SDDC is that they ‘get it’ and they are starting to build some genuinely innovative solutions in the form of ViPR and buying some leading companies to flesh out the storage portfolio. We also have a really good relationships with HP, Cisco, VMware and Microsoft, and discussions with all of them helped shape our overall thinking on the Cloud. We haven’t really talked to many vendors outside this for a couple of reasons but chief among them was that we felt we had enough information to start making informed decisions and we were also happy with the providers we had in place. There is not a great deal of value in changing for changes sake and that is the approach we took initially. I think you can take a couple of options to Cloud adoption; the big bang revolution type approach, or the more cautious evolutionary approach. My thinking was that the risk averse nature of the organisation and cultural aversion to change meant that evolution was more likely to be a successful approach. It was more important for us to engage with vendors and partners that have a relationship with us and who understand our business and challenges. However that said it did become apparent later in the process that to deliver the changes we were expecting, we may need to look outside our current pool of partners and indeed that is what happened, but that’s for a future blog! Taking all this knowledge and lessons learned and then forming it into something approaching a proposal, I then went about securing some investment in time to look at how we might scope a project specific to our organisational requirements. I’ll cover this in more detail in the next blog. Previous Post: Cloud Journey Part 2: Its all about the Server…. or is it?